Mikhail Ilyashev and Maksym Kopeychykov were listed among the best lawyers in 2016 according to the International Directory Best Lawyers International. Miklhail Ilyashev, Managing Partner at Ilyashev & Partners Law Firm, was recognized as one of the best lawyers in Litigation – Commercial, and Partner Maksym Kopeychykov – in real estate. 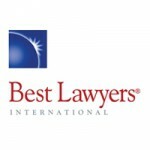 First published in 1983, Best Lawyers International is one of the reputable international legal directories. For more than three decades, Best Lawyers lists have earned the respect of the profession, the media, and the public, as the most reliable, unbiased source of legal referrals anywhere. Best Lawyers peer-reviewed listings are now published in almost 70 countries around the world.